Time-lapse video: What I learned by taking a photo of myself each day for the last five years. What I learned by taking a photo of myself each day for the last five years. 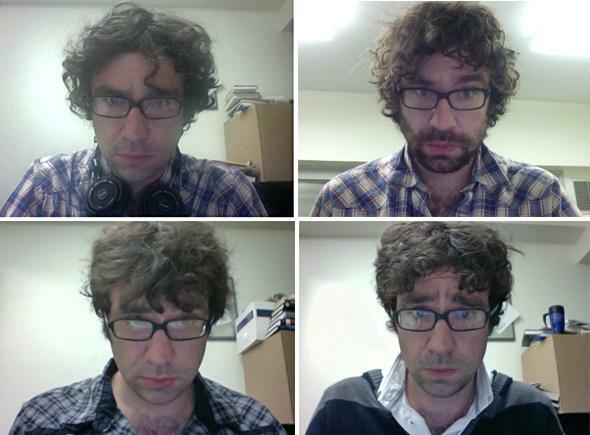 Five years ago, in January 2010, I decided to take a picture of myself every day for an entire year. I did this for a few reasons: boredom, narcissism, a lifelong fondness for weird and unnecessary projects. But I also realized that much of my adult life had gone undocumented. My parents have countless photo albums of themselves in their 20s and 30s. I have a bunch of pictures from a beard and mustache festival in 2003. And I wasn’t even in the festival! I started using my MacBook to take a self-portrait every day. OK, not every single day without fail, because it didn’t occur to me at the time that it would sound way more impressive if my commitment was totally unwavering. But I took a photo pretty much every day, and once the year was up I kept on going. Why not? Taking one of these pictures took only a couple of seconds per day, and it always gave me a small sense of accomplishment. On days when I was struggling to do my work, I knew that I could always check “take photo” off my daily action list, and it always felt good. I suggest that you start your day with something similarly pointless and easy to accomplish. After a couple of years, despite my best efforts, this project started to feel meaningful. Not real-world meaningful, but personally meaningful—or at least something with the possibility of becoming personally meaningful. I had always enjoyed those time-lapse videos, ones with titles like “Man Takes Photo of Himself Every Day for Eight Years in Incredible Video.” Maybe if I stuck with the project long enough, I would have enough material for a video of my own, one that would deliver some sort of insight into my life. Five years and 1,300 photos later, the results are in. As you’ll see, my life is very boring. I spend most of it in offices, or at home, or in transit between the two. The specific offices, apartments, and modes of transportation might change, but the backdrop remains the same. Fair question. It used to be that we’d take a picture because there was something about a particular moment that felt like it ought to be preserved, something pleasant or unusual. The things we photographed were notable because they stood out from our daily lives. That’s why we tend to associate photographs with parties and vacations. These are the things we’ve done that are the least representative of how we spend most of our days. We want to remind ourselves that we’re not always doing the exact same thing, that we’re not always boring. In the age of the smartphone, there’s nothing special about most of the photos we take. There is certainly nothing special about the photos I’ve taken over the last five years. Yes, a few of them are notable, or at least strange. There are images of my wedding day, the morning after I got in a bad bike accident, and the time I experimented with a weird old-timey mustache. (One day soon, I will fulfill my dream of being in a beard and mustache festival!) Mostly, though, this is a collage of usual moments. And that’s why I like it. It’s hard to notice time passing, even when you’re watching time pass. That’s the takeaway, for me. There’s no dramatic aging. You live your life. Most days are pretty much the same. You forget most things you’ve done. Then it’s over. These are non-postcard moments, and I’m glad I’ll now have them to cherish forever. As I said, I’m a narcissist.